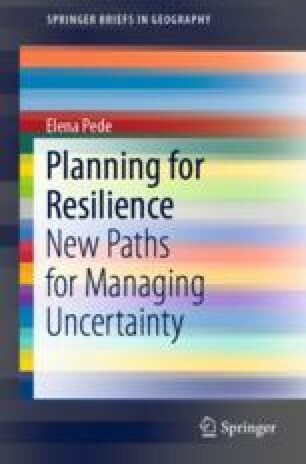 The chapter aims to develop a conceptual framework for orienting the resilience-building challenges in planning. In a world in which the only certainty is uncertainty, resilience has become one of the most widely used concepts that has come to prominence in understanding and managing complex systems in the last decade (Welsh, Geogr J, 180:15–26, 2014). The concept of resilience was firstly formulated in ecology during the 1960s, but it has influenced many other research fields. With the advent of the social-ecological perspective, the resilience theory has also influenced political and human geography and environmental studies, with new explorations and paradigms (Davoudi et al, Plan Theory Pract 13:299–333, 2012). In particular, resilience has become a “pillar” of disaster management, climate adaptation, and regional economic development (Davoudi et al, Plan Pract Res, 28:307–322, 2013). However, the widespread use of resilience thinking has not brought any conceptual clarity but has instead contributed to the fuzzy character of the concept. The chapter firstly traces the conception of resilience and its three main currents: engineering resilience, ecological resilience, and socio-ecological resilience. Secondly, it presents how resilience can be linked with vulnerability, and finally it outlines the resilience interpretative approach to emergency management asserted in this work. The chapter also deals with the criticism to resilience in the literature, such as the unified positive meaning given to the concept and the devolution involving responsibility.